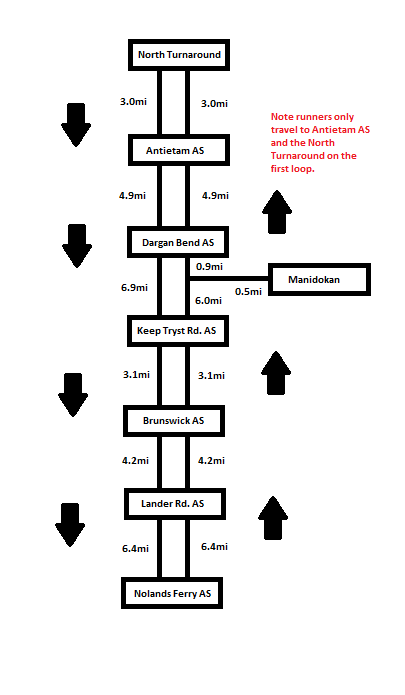 Below is a diagram showing the distances between each aid station. You may access drop bags at the Brunswick AS, the Noland's Ferry AS, and the Start/Halfway/Finish. A detailed course map may be found here. The excel file below lists the mileages for each aid station, and the distances between each aid station for the duration of the race as well as aid station open/close times and official cutoff times. Note, the race course has not changed from 2015, the below files are accurate for 2019. These same numbers are also copied below. You must have left the aid stations at the following specified times or you will not be allowed to continue on the course. Beyond these products, each aid station will vary among the other products AS captains choose to have. Typical goodies might include chips, pretzels, PB&J, assorted fruits, soup, etc. Rest assured you will be well fed. We suggest you experiment with Tailwind Nutrition, and Honey Stinger so that if you find they will not meet your nutritional requirements you can be sure to pack other items in your drop bags. Note that Tailwind Nutrition can be purchased locally from If The Shoe Fits and Two Rivers Treads as well as online through the Tailwind Nutrition website. Honey Stinger can be purchased online from any number of retailers including directly from their website. All aid stations will have the various first-aid necessities of a 100 mile race. AS captains reserve the right to withdraw a runner from the race or prevent them from continuing onward for a certain time period due to medical reasons.